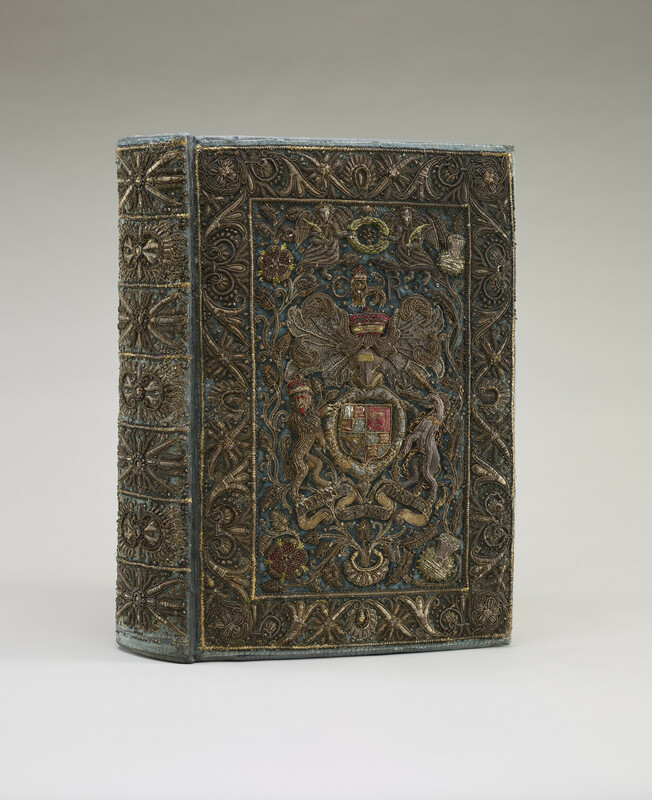 Bound in blue velvet, embroidered with coloured silks, silver and silver-gilt wire; fore-edge painting of the Royal arms. This splendid Bible, and its companion Prayer Book (RCIN 1142253), were probably bound for Charles II's Chapel or Royal Closet at Whitehall, where he had two sets, Bible and Prayer Book uniformly bound, replaced every few years as part of the Chapel refurnishing. As the Prayer Book of this set is a 1660 edition, this must have been one of the earliest sets; the newly revised standard edition would have been used after 1662. This edition of the Bible, though notorious for the textual inaccuracy of John Field, Printer to the University of Cambridge, was one of John Ogilby's more splendid publications, with plates by the Bohemian artist Wenceslaus Hollar (1607-77). The binding is a late example of embroidery using metallic threads on velvet. These threads were formed by winding thin flexible strips of silver or silver gilt tightly round several strands of silk. To form thicker cords, two or more such threads were twisted together, and the coloured silks were plaited into fine cords. The decoration includes the Stuart arms and the initials CR for Carolus Rex (King Charles), with 2 within the C for Charles II. The embroidery was repaired about 1930 by the Royal School of Needlework, and again in 1964 by Mrs Evelyn Birkill. The Bible and Prayer Book were found in a tin bath at St Michael's College, Tenbury, Worcestershire, in 1919, by the Reverend EH Fellowes, a Minor Canon of Windsor, who was cataloguing the books there. He mentioned this surprising find to Queen Mary, who helped purchase the volumes for the Royal Library. They had been in the college's large bequest of books from its founder, Sir Frederick Ouseley (1825-89). He had inherited them from his mother, née Harriet Georgina Whitelocke, wife of Sir Gore Ouseley. The bookplate of her father, John Whitelocke, is in both volumes. They may therefore be the 'coronation bible and prayer-book' reputedly given to Bulstrode Whitelocke, the Parliamentary lawyer, by Charles II in June 1660 (ten months before his coronation). Printed in Cambridge by John Field for John Ogilby, comprising 1,722 pages, seven plates and is two volumes in one. Catalogue entry from Royal Treasures, A Golden Jubilee Celebration, London 2002.